Laurent Binet is the latest intellectual maverick to win the 2010 Prix Goncourt du Premier Roman. 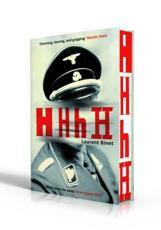 His masterpiece, HHhH traces the events and persons involved in Operation Anthropoid, the plot to assassinate Reinhard Heydrich, a Nazi henchman who earned a plethora of nicknames from ‘the Butcher of Prague’ and ‘the man with the iron heart’ to ‘HHhH’, a quip he supposedly circulated around Germany himself, an acronym for Himmlers Hirn heisst Heydrich (Himmler's brain is named Heydrich). Parisian Binet studied literature at the University of Paris where he now lectures on French literature. He is also the chronicler of French President François Hollande, and his next work will document Hollande’s successful presidential election campaign.